Retire in Montana if you need your space. The state is aptly named, Big Sky Country. The sky is blue, you are surrounded by mountains and friendly people. You can enjoy Montana in a frugal manner as well. 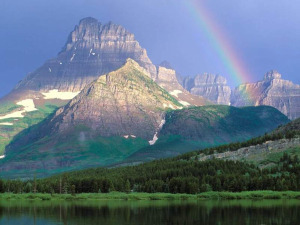 We have often said, if we get tired of seeing Glacier National Park, it's time to cash in the chips. At the risk of starting an argument...it is the most beautiful National Park in the US. It is not on the beaten path. You have to be going to Glacier to get there. If you haven't gone yet do so ASAP. 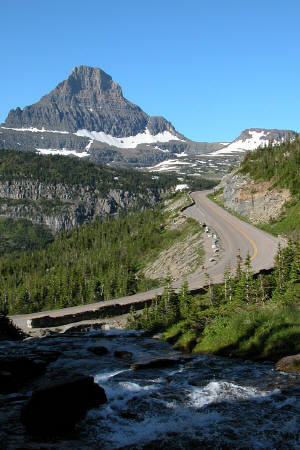 This is the Going to the Sun road. An engineering masterpiece that is a registered National Monument. Started in 1921 and completed in 1932. It is 50 miles long. Vehicles over 21 feet long or 8 feet wide are not allowed...Once you drive it you will see why. From the east you follow St Mary's Lake for a good part of the trip up to The Logan's Pass Visitor Center. Established in 1910 as our 10th National Park, it encompasses over 1.3 million acres of wilderness beauty. How popular is it?...It is not unusual to circle the parking lot for 30 minutes to get a spot...I'm not making this up. How can I Retire in Montana in a frugal manner? Montana has a little less than 1 Million residents spread out over 146,000 square miles. No other state has fewer people per square mile. In fact, the "average" square mile contains 7 humans, 1 elk, 1 antelope and 3 deer. It is a safe bet that more game is consumed in Montana than beef. Folks if you shoot it yourself it will be cheap. 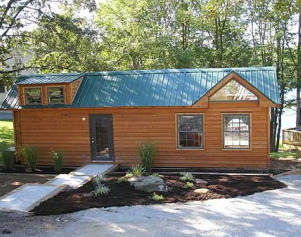 With this kind of room, Montana offers opportunities for park model living on your own land or in a park. A cabin type look would be more appropriate for retiring in Montana. Sure it gets cold, but there are many insulation advantages with factory built houses vs site built homes. 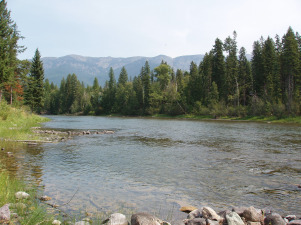 What to do when you retire in Montana? Yep ,you guessed it...its an outdoorsy place. Hunting, fishing and hiking are all very big in Montana. If your thing is fly fishing (that would be me) you have found your little slice of heaven. Streams like this are plentiful...no stocked fish, they are nothing but wild trout. For the hardier among you retiring in Montana will probably belong on your short list of best state to retire in. I would think a perfect set up would be a park model in Montana for the summer and a park model in Arizona for the winter.